Although the family had been involved in making extracts for three generations previously, Charles H. Baldwin and his father, H. M. Baldwin, officially established the company in 1888. That's over 125 years ago! Charles Baldwin peddled his extracts all over the Northeast while his wife stayed home and raised the family, tended the farm and packed up the orders to ship to her husband for distribution. The present owner, Earl Baldwin Moffatt, is the great-great grandson of the founder. The vanilla bean is actually the fruit of a tropical orchid. Baldwin's Pure Vanilla Extract uses only the best, most flavorful and most expensive variety of bean - the Bourbon Vanilla Bean from Madagascar. The aging in our over 100-year-old oak barrels mellows and intensifies the extract, making a stronger, darker, richer and more flavorful product. 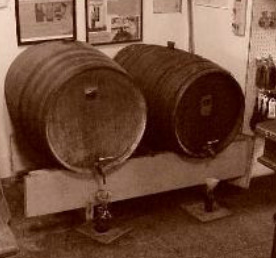 These barrels are invaluable to the flavoring process. They have been seasoned over several generations and continue to improve with each and every new batch. The ingredients and aging process which add so much to the character of Baldwin's Vanilla cannot be duplicated by industrial mass producers. Baldwin's Pure Vanilla Extract blends easily. The mouth-watering flavor and aroma remain through cooking and baking to every last bite. Baldwin's Vanilla Extract has been made in the same solid copper percolator, aged in the same oak barrels, using the same recipe and Bourbon vanilla beans. 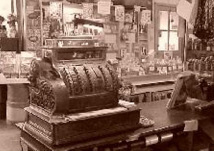 Our customers have been with us for generations. All Baldwin's extracts and flavorings are produced with the same care and high standards as they have been for over 125 years. In the 1920s, Earl Baldwin, son of Charles Baldwin, developed Baldwin's Table Syrup in response to requests for a good-tasting syrup that was not as expensive as pure maple syrup. It does not contain preservatives, artificial color or artificial flavor. The taste is so light and delicious that many customers actually prefer Baldwin's Table Syrup to the pure maple syrup. It is packaged under sterile conditions. After opening, store in the refrigerator. 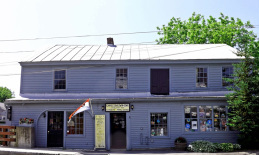 In 1912, the business was moved to its present location on Center Street in the village of West Stockbridge on the banks of the Williams River. The vanilla has been made here in the former carriage shop for over 100 years. The solid copper electric percolator, nicknamed "the still" because of its appearance, is where the extraction takes place. The main floor of the building is a retail store selling all of our Baldwin products; our famous pure vanilla extract including many other pure extracts and flavorings. We also manufacture “Mr. Baldwin’s Proper Bloody Mary Mix”, Walnut Russe, Baldwin’s Maple Table Syrup, Vanilla Vinaigrette, Vanilla Cinnamon Sugar and even the old favorite, Bay Rum Aftershave. We also carry baking ingredients, various country store items, retro candies, greeting cards, toys and so much more! Check out our old time photo booth as well! The store is open year 'round. Please visit us when you pass through the Berkshires.